Dr Paddy O'Toole conducting an interview with Mr Dyet of Quan Lan (photo by Nguyen Loan, courtesy of the Bach Dang River and Van Don Research Team). Dr. Paddy O'Toole and interpreter Ms Nguyen Loan conducted four interviews in Quan Lan and visited shrines, temples and important sites related to the Battle of Van Don. 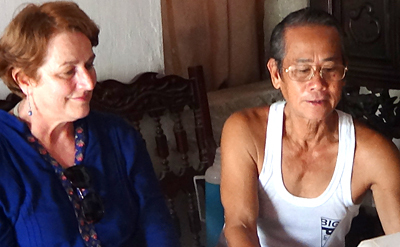 They also talked informally to local people and collected written records. Interviews were recorded on an Olympus DS-40 Digital Recorder, and some elements of interactions between the researcher and people being interviewed were captured on a Sony Handycam HDR-PJ200 camera/video recorder. 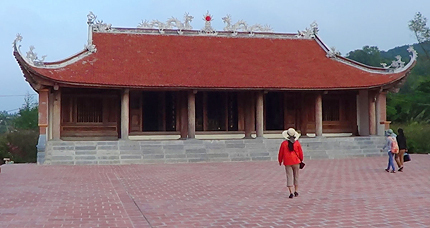 Photographs and video were also recorded of shrines, temples and landscapes on Quan Lan. Further analysis will occur in Australia using NVivo qualitative analysis software. The story of the Battle of Van Don and its commander, Tran Khanh Du, stays powerful in the community through a variety of ways. Many of these ways involved children, as well as adults. The stories told by elders were listened to by children. School children are involved in caring for the shrine of Tran Khanh Du through an arrangement between one secondary school and the shrine. The famous Festival of the Battle of Van Don also involves local school children and is included in the history lessons of secondary school children. The Tran Khanh Du temple on Quan Lan island during the 2012 season (photo by Dr Paddy O'Toole courtesy of the Bach Dang River and Van Don Research Team).